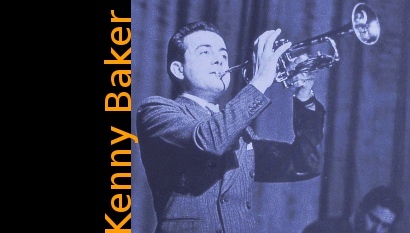 Kenny Baker CDs @ Hep Records, jazz in depth from the 1930's to the present day. Kenny Baker was born March 1, 1921 in Yorkshire. His early years were spent mastering his instrument with the brass bands in the area. But the jazz bug had bitten him and by 1939 had settled into the jazz and swing scene in immediate prewar London and played with, amongst others, the Lew Stone band although he didn't record with it. With the advent of war he joined the RAF and often found himself playing next to George Chisholm in the Squadronaires band. Throughout the war years he was in demand to record with London's leading bands including Buddy Featherstonhaugh, Harry Hayes and George Shearing, and was annually voted the Melody Maker trumpet pollwinner. At this point his story is inextricably linked with trombonist Ted Heath, another brass band graduate, well known for his work with Ambrose and was later featured with the Geraldo Orchestra. In early 1944 Heath was deciding whether to form his own orchestra and put together an all star band for a Decca recording session and Kenny Baker, still in the RAF, was included. The first real Heath orchestra didn't appear in public till October 1944 at the annual Jazz Jamboree at the Stoll Theatre, London. Meanwhile a cautious Heath, still working for Geraldo, fell under the spell of the then resident Glenn Miller AEF organisation and was spurred to making the final break in May 1945 and formed his regular orchestra which of course included Baker. Baker played with the Heath band till 1949. Heath was basically a conservative musician, who had never really wanted a wild swing band, and often had to stand up to the demands of the younger players usually led by Baker and Jack Parnell who were wanting to play hot. Baker then decided it was time to try his luck as leader and struck out on his own, and for the next five decades became a central figure in the London and UK jazz scene. Such was his international stature as lead and solo trumpeter that following the death of Harry James in 1983 there was a serious attempt made by the James Estate to have Baker installed as leader of the New Harry James Orchestra. However it proved an impracticable idea and did not happen. For the remainder of Baker's professional life he was in constant demand for TV and Film studio work, and on innumerable occasions went on concert tours with top visiting American stars. Almost till the day he died on December 7, 1999, Kenny Baker was active as part of the Best of British jazz package and is by general consent the most influential jazz trumpet player produced in this country. The Hep CD is a collection of his first great period as the leading trumpet soloist in the UK and shows the power and invention of the man. Kenny Baker - "Ain't Cha Got Music?"